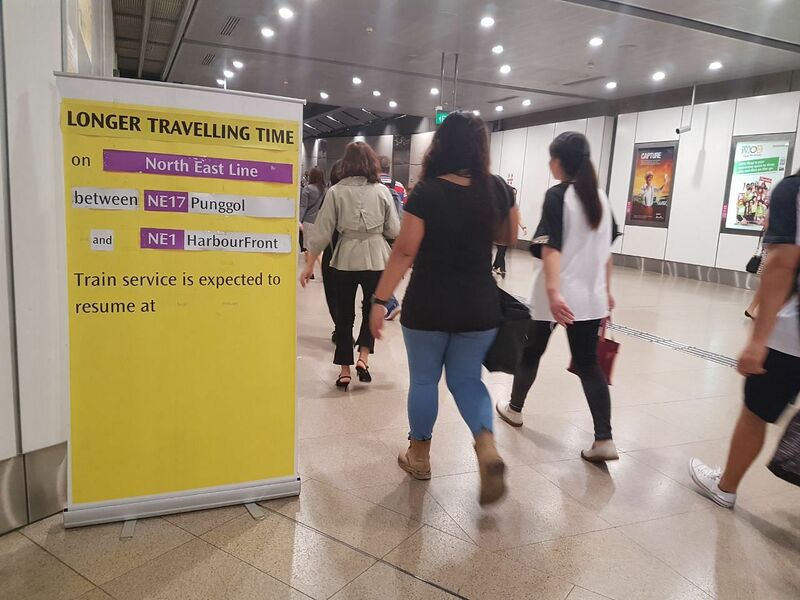 SINGAPORE - Commuters on the North East Line (NEL) faced lengthy delays on Wednesday morning (April 11) due to a faulty train at Little India station. Train service between Potong Pasir and Outram stations was also suspended briefly during the hour-long disruption, before resuming at 8.36am. "Longer travel times of about 30 minutes were experienced during this period as a 12-car push out to HarbourFront Station was conducted to get the faulty train off the track," she said. Ms Tan said free bus rides and free bridging bus services were available between Outram Park and Potong Pasir stations to help commuters to continue their journeys. Ms Tan apologised to affected commuters for the inconvenience caused and said the company was investigating the cause of the train fault. 7.58am: NEL delay - Due to train fault at Little India, trains are moving slower speed. Please add 30 minutes of travelling time between Punggol and HarbourFront. Free bus boarding are available from Outram Park to Potong Pasir stations. SBS Transit first tweeted about the fault at Little India station at 7.35am, warning commuters to expect delays of about 15 minutes along the entire line. This was later revised to 30 minutes. It explained that trains were moving at a slower speed due to the fault. On Monday morning, commuters also faced delays on a west-bound strech of the East-West Line due to a track fault.